ADFS auth page URL added to bypass list. 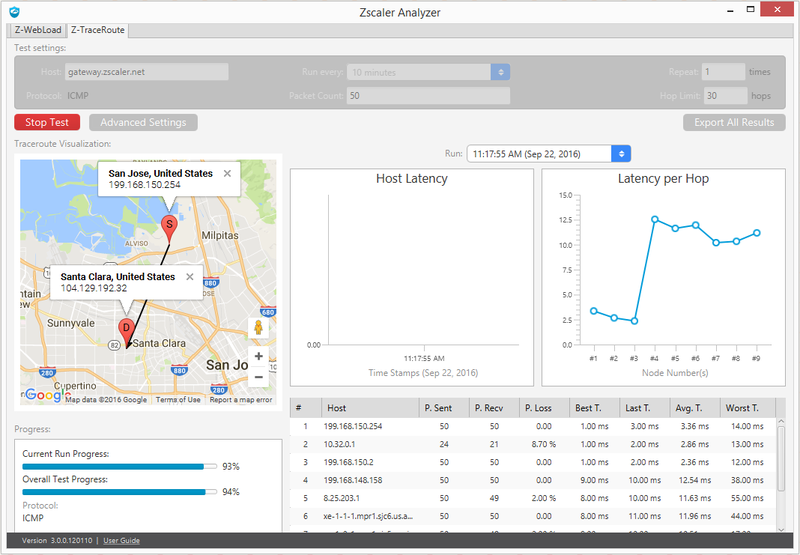 Use the Zscaler Analyzer app to analyze the path between your location and the Zscaler Enforcement Node (ZEN), or to analyze the time it takes for your browser to load a web page, so the Zscaler Support team can detect potential issues. The app performs an MTR (Z-Traceroute) and a full web page load test (Z-WebLoad). The results provide the Zscaler Support team with all the information they need to debug network issues quickly. You can run the app multiple times at different intervals, for a more comprehensive view of your network path and performances. For example, you can run configure the app to run every hour for five hours. The results are designed to be sent to the Zscaler Operations Team through Zscaler Support for analysis. Their experience and overall view of the entire cloud allow them to interpret the data and identify potential issues in the network path. Zscaler highly recommends that you do not try to interpret the results without consulting Zscaler Support. (ii) store such information in its cloud (which will only be accessible by a unique URL). YOUR USE OF THE ZSCALER ANALYZER IS EXPRESSLY CONDITIONED ON YOUR AGREEMENT TO THESE TERMS AND CONDITIONS. IF YOU DO NOT AGREE, DO NOT DOWNLOAD AND/OR OTHERWISE USE THE ZSCALER ANALYZER. Download the latest version of the app at https://zmtr.zscaler.com/. Click either Windows or Mac OS to download the app. Ensure that you install the app in a directory similar to Libraries/Documents to facilitate installation. If you install it in the Program Files directory, you may need additional permissions. Launch System Preferences from the Apple menu authentication. Choose Security and Privacy, click the General tab, and then click the lock icon in the corner to unlock the settings. From the Allow applications downloaded from list, choose Mac App Store and Identified Developers. Accept any security warning, if presented. If you are using a GRE or IPSEC tunnel to send traffic to the ZEN, the MTR must run from a PC that does NOT go through the tunnel. An MTR done through a tunnel will not show useful information. When you launch the app, click the Z-TraceRoute tab to see a window similar to the following. Host: If your computer is connected to a ZEN, this field displays the host name of the ZEN. You can specify a different host name, for example, if you want to analyze the path to another ZEN. Run Every: The app can run automatically at different intervals. For example, to configure the app to run every hour, 10 times, change Repeat to 10, and then choose the interval to Repeat every 1 hour. These 10 tests are called a group. Packet Count: Number of packets to send. Hop Limit: The maximum number of network hops measured. 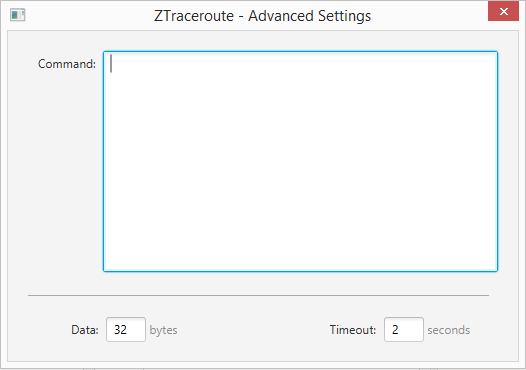 To define the following settings, click the Advanced Settings button to see the Z-Traceroute - Advanced Settings window. host        	Ping the specified host/IP address until stopped. protocol    	Protocol to be used in probing. port        	Port to be used in probing. repeat      	Number of times to repeat the test. interval    	Gap between each test run (in minutes). data        	Length of raw data used. count       	Number of packets per node. maxhop      	Number of maximum hops. timeout     	Timeout in seconds to wait for each reply. The app displays the geolocation of the client and the ZEN on the map, as shown below. Note that the locations shown may not be accurate. This is useful in determining if the client is geolocalized correctly or if its traffic is not going to the nearest ZEN. 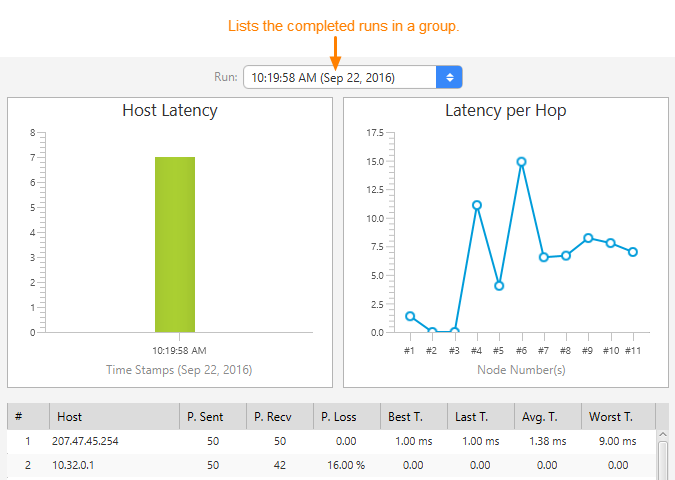 The application updates the Host Latency and the Latency per Hop widgets, and the results table. The Stop Test button replaces the Start Test button, as shown below. If you click the Stop Test button at any time, the app cancels all the other tests in the group. 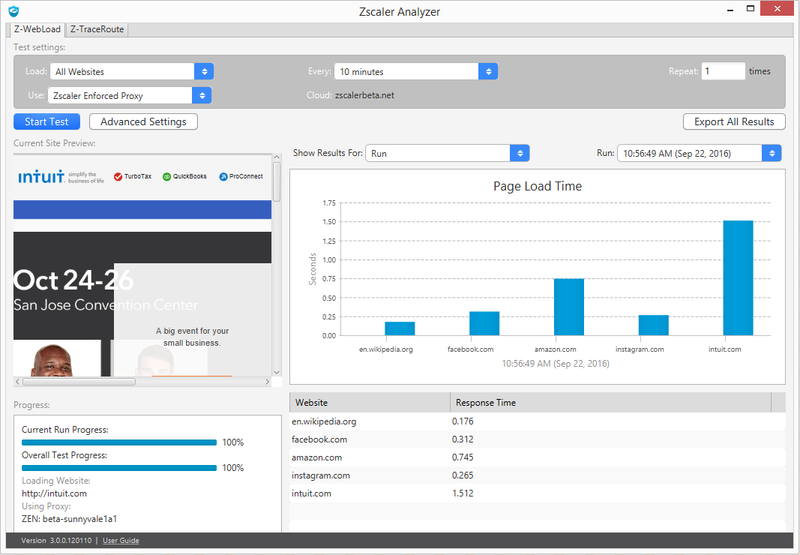 You can minimize the Zscaler Performance Analyzer app before it completes all the configured runs. When the tool completes all the runs, the Start Test button replaces the Stop Test button. If you configured the Zscaler Analyzer app to perform multiple runs, you can view the results for each completed run in the group by selecting it from the results list, as shown below. 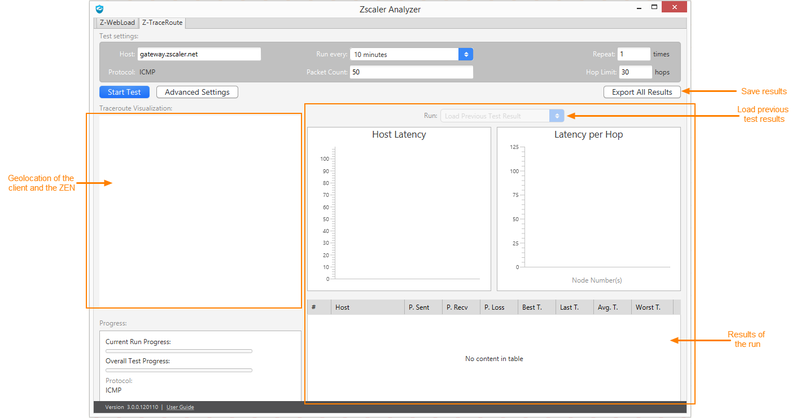 The Host Latency widget shows the latency that occurred when the device reached the ZEN. The Latency per Hop widget shows the latency for each intermediate network hop. When the app completes all the configured runs, export the results so you can send it to Zscaler Support. Click the Export All Results button and navigate to the folder to which you want to save the results. All results of the runs in a group are saved into a CSV file with a filename similar to za_results_12_15_2015_12_56_53_PM_PST. The geolocation shown in the export file is likely to be incorrect. For example, the intermediate hops in the U.S. might be shown to be in Europe. Protocol: Protocol selected for the test. 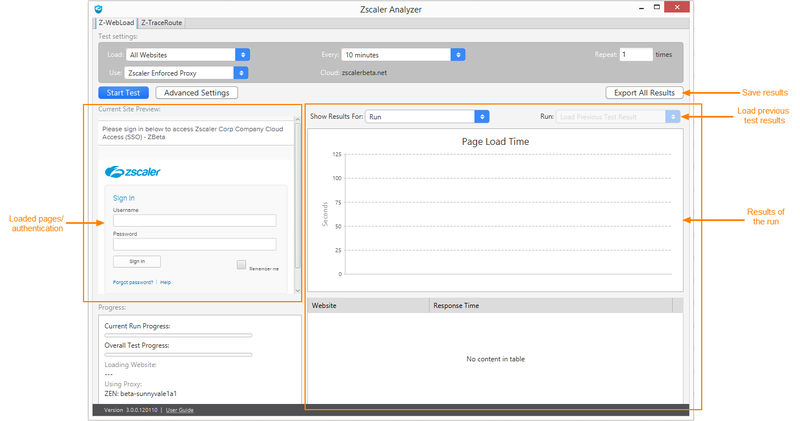 Use the Zscaler Analyzer app to analyze the time it takes for your browser to load a web page, so the Zscaler Support team can detect potential issues. 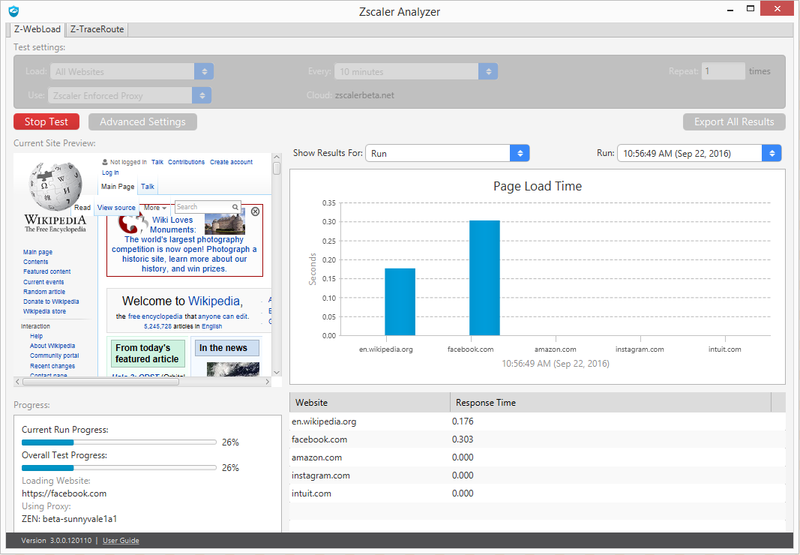 The app performs a web page load test and the results provide the Zscaler Support team with all the information they need to debug issues quickly. Depending on your environment, the tool can compare the load time through a ZEN and load time going direct to Internet. You can run the app multiple times at different intervals, for a more comprehensive view of your network. For example, you can configure the app to run every hour for five hours. 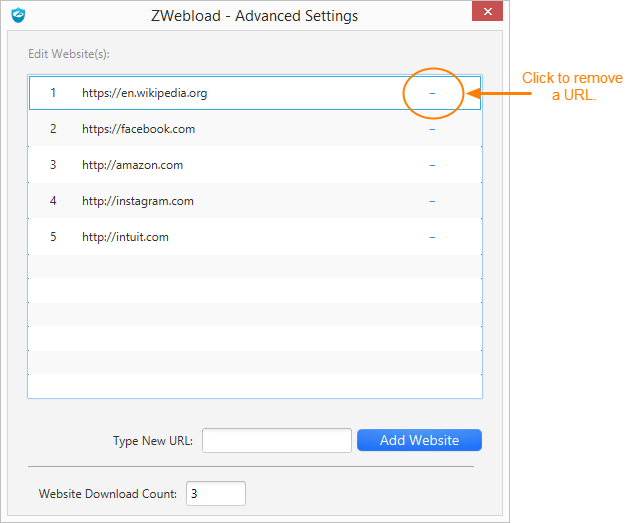 Load: The app can test up to ten URLs at a time. The app provides a default list of URLs to run. You can choose to run the tests for all URLs or just one. To remove or add a URL, click on the Advanced Settings button. Every: The app can run automatically at different intervals. For example, to configure the app to run every hour, 10 times, change Repeat to 10, and then choose the interval to run Every 1 hour. These 10 tests are called a group. 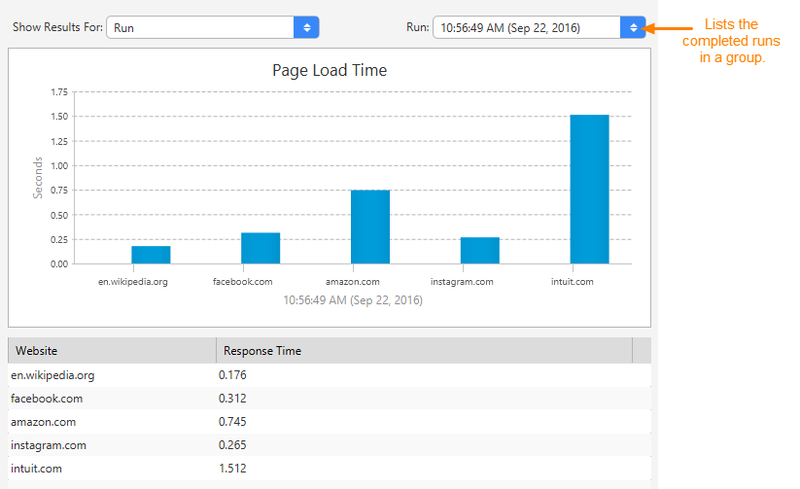 Use: The Page Load Time widget provides different results depending on your environment when you first open the app. If your traffic is going through the Zscaler service when you first start the app, you are running the app with the Zscaler Enforced Proxy. If you are not authenticated to the service, you may be asked to authenticate when the app is first opened. The authentication page is displayed in the Current Site Preview on the left. System Proxy: Choose this option if you want to use your Internet browser settings. For example, if you have configured your browser to use a PAC file or a ZEN, the app will use those settings. Custom PAC File: Choose this option if you want to use a PAC file to forward your traffic to the Zscaler service. The Zscaler service hosts default PAC files which are configured to automatically forward all browser traffic to the nearest ZEN. To learn how to retrieve the default PAC file URL, see How do I use PAC files to forward traffic to the Zscaler service? Custom Gateway: Choose this option if you want to specify a ZEN to which you want to forward your traffic. Gateway: Enter gateway.<cloud_name>. To learn how you can find your cloud name, see What is my cloud name? Port: Enter the port number. To define the following settings, click the Advanced Settings button to see the ZWebload - Advanced Settings window. Edit Website(s): To remove a URL, choose a URL, then click the minus sign. Type New URL: To add a URL, enter a valid URL into the field, then click Add Website. Website Download Count: The number of times each website is downloaded. The app displays the web pages of the URLs in the list, as shown below. 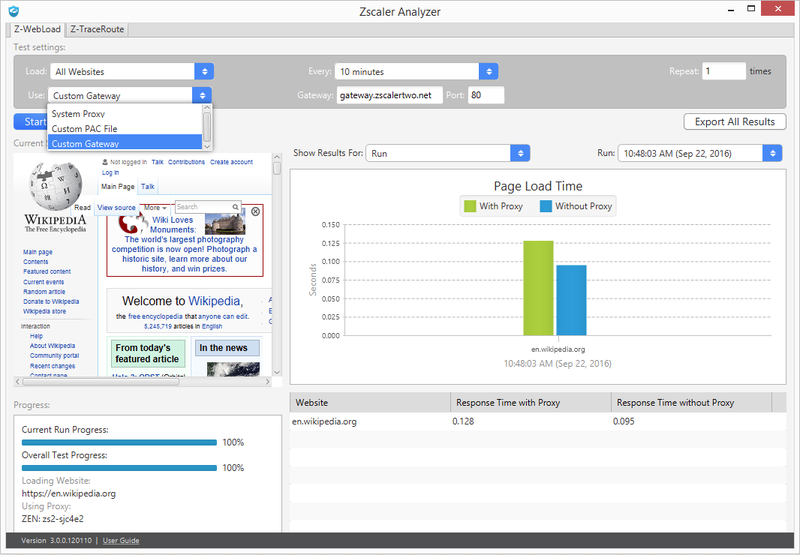 The application updates the Page Load Time widget, and the results table. 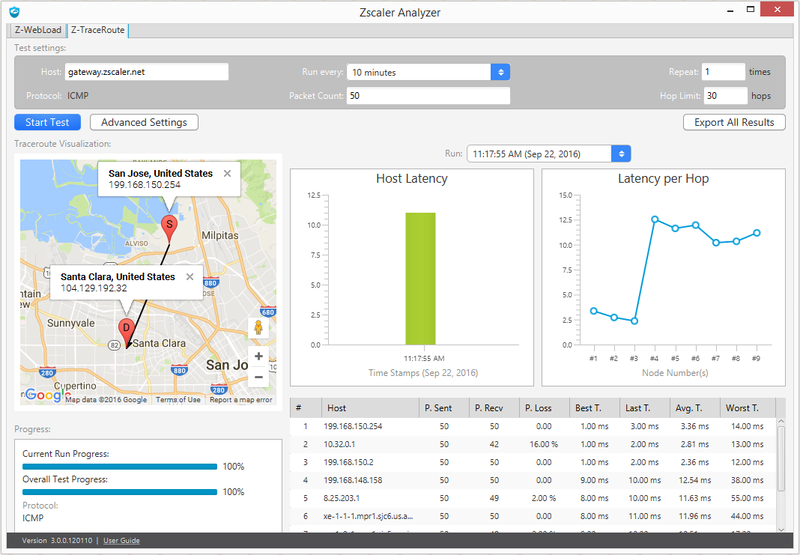 You can minimize the Zscaler Analyzer app before it completes all the configured runs. When the tool completes all the runs, the Start Test button replaces the Stop Test button. If you configured the Zscaler Analyzer app to test multiple URLs, you can view the results for each URL in the group by choosing Website from the Show Results For list. 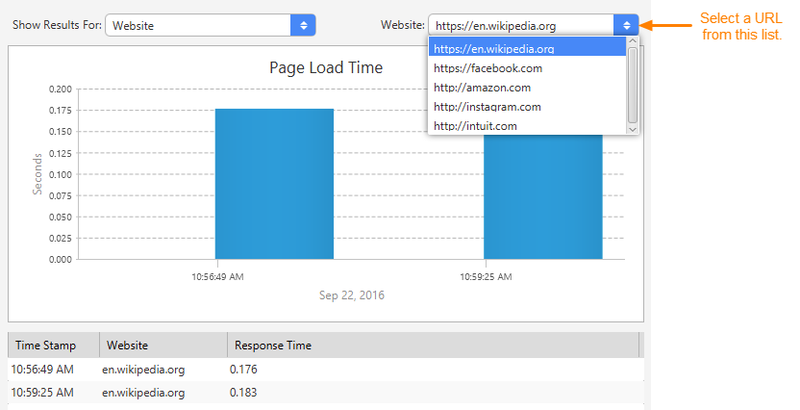 The Page Load Time widget shows how long it took your browser to load a web page. 1. Click the Export All Results button and navigate to the folder to which you want to save the results. All results of the runs in a group are saved into a CSV file with a filename similar to za_results_12_04_2015_09_49_51_AM_PST. Attach this file to a support ticket and submit it. The export file contains all the information required by the Zscaler Support team to interpret the results correctly. Please do not modify the file before sending it to Zscaler. Full Page Time: The time it took the browser to load the entire web page and all its assets, such as images, scripts, etc.